Intelsat 37e is a commercial communications satellite built by Boeing Space Systems for operation by Luxembourg-based telecommunications provider Intelsat as the fifth in the company’s Epic-NG satellite series designed to deliver flexible communications services on a global scale, leveraging the latest advances in satellite technology including multi-band satellites, frequency re-use and different beam widths. The Epic architecture delivers global high-throughput services utilizing the C-, Ku- and Ka-Bands, a combination of wide beams and spot beams as well as frequency reuse to provide a high degree of flexibility to customers. 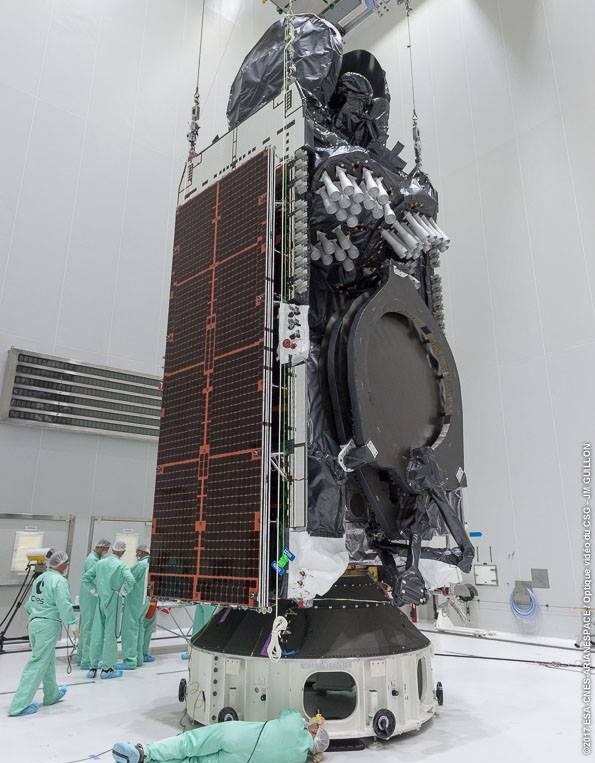 The Intelsat 37e satellite combines a high-throughput Ku- & Ka-Band and C-Band package to deliver high-performance services through a combination wide and spotbeams as well as steerable beams to direct capacity where it is needed when it is needed. 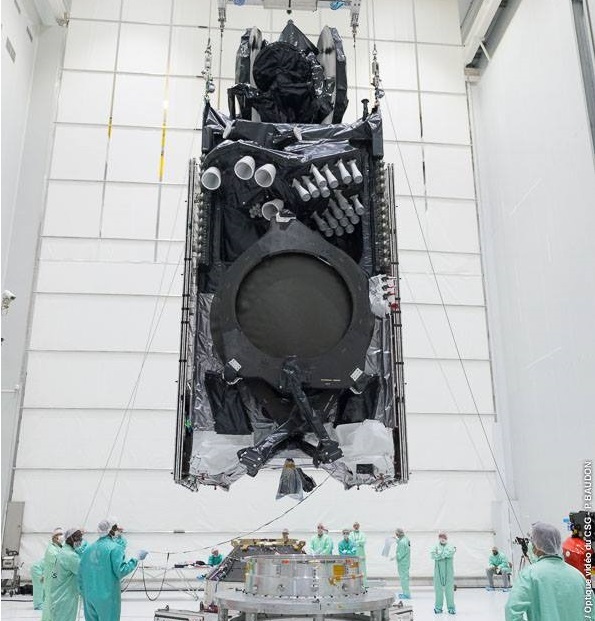 The Intelsat 37e satellite continues to implement advanced technology with enhanced power sharing capabilities for flexible assignment of power between shaped, fixed and steerable spot beams operating in Ka- and Ku-Band. This allows an optimization for in-demand applications by region, representing a significant efficiency improvement for mobility and government customers. The satellite is also the first to offer interconnectivity between its three bands, C-, Ku-, and Ka-Band. The combination of high-capacity spot and wide beam coverage enables improved throughput for data-intensive services like wireless backhaul, VSAT, enterprise and mobility services in the Americas, Africa and Europe. The C-Band payload on Intelsat 37e has a combined bandwidth of 3,240 MHz, hosting 90 transponders (36 MHz equivalent units) that create a total of eight coverage areas. 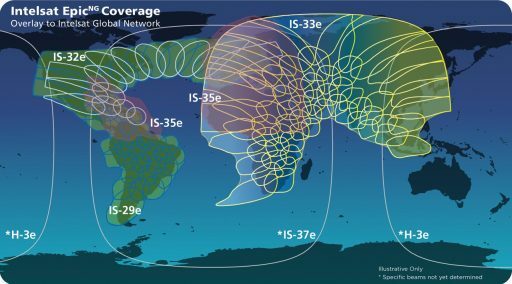 Intelsat 37e delivers a global C-Band coverage area over Europe, Africa, the Atlantic Ocean, South America and the Eastern U.S./Canada plus four spot beams over the Eastern United States & south-eastern Canada, Europe, South America and Sub-Saharan Africa. 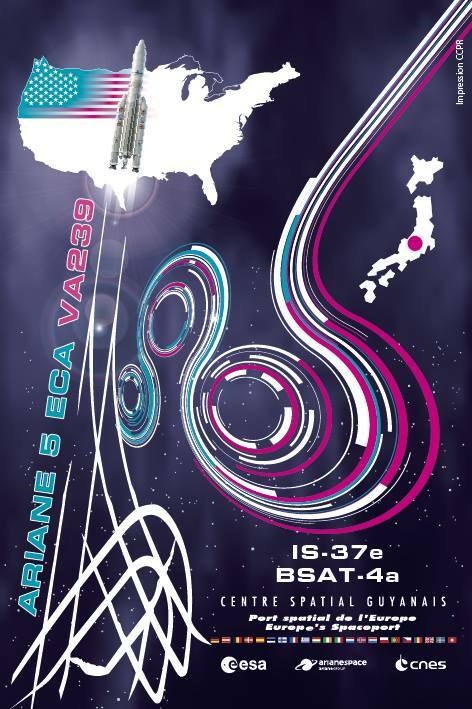 Intelsat 37e hosts 275 (36 MHZ equivalent) Ku-Band transponders with a bandwidth of 9,900 MHz, generating a total of 56 fixed Ku-Band beams cover the entire continents of Europe, Africa (with the exception of Madagascar) and South America as well as the Caribbean, parts of Latin America and the Eastern U.S. 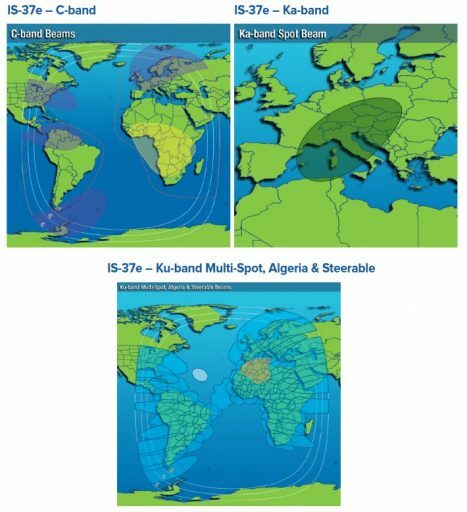 In addition, Intelsat 37e delivers a focused Ku-Band beam covering Algeria and a steerable Ku- high-capacity spot beam to direct additional coverage where it is needed. The Ka-Band payload delivers a single steerable, high-power spot beam baselined for use over Europe with a total bandwidth of 1,332MHz. I37e offers a data throughput of 45 gigabits per second. Intelsat’s Epic technology implements frequency re-use which refers to a satellite using the same frequency multiple times resulting in a significant increase in the efficiency of spectrum utilization and boosting the total bandwidth that a spectral band can deliver. Interference is avoided by combining different frequencies and polarizations, allowing frequency reuse over the same geographic area. Intelsat expanded frequency re-use from the traditional Ka-Band high-throughput application to the C- and Ku-Band spectrum which can be combined with traditional wide and spot beams for high-throughput and broadcasting services from a single satellite. Intelsat 37e uses Epic technology for all of its frequency bands as the first in the Epic series. 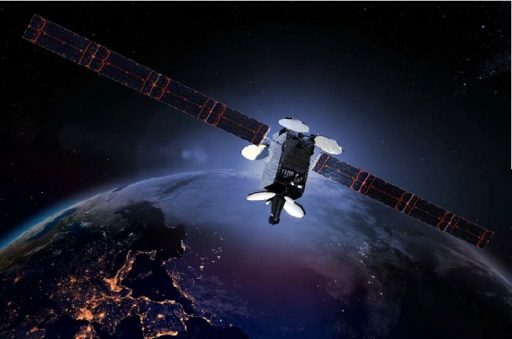 Intelsat signed with Boeing in 2009 to be the first customer for the 702MP medium-power version of Boeing’s flagship satellite bus, ordering four satellites (21, 22, 27 and Intelsat 29e as the first Epic satellite). An additional order was placed in 2013 for another four 702MP-based Epic satellites and a ninth 702MP (the sixth Epic) craft. After ordering the Intelsat 37e satellite, Intelsat announced it would replace the Intelsat 901 satellite launched in 2001 at an orbital position of 18°W. Services will seamlessly transition to Intelsat 37e as the 901 satellite enters decommissioning after exceeding its planned 15-year service life. Built for a 15-year service life, Intelsat 37e has a launch mass of 6,438 Kilograms, riding in the upper slot of an Ariane 5 launch vehicle. In its stowed configuration, the satellite stands 7.9 meters tall and its 3.7 and 3.2 meters in width and depth. Electrical power is generated by two deployable solar arrays and stored in Li-Ion batteries with dedicated avionics conditioning the satellite power bus that supplies electrical power to the various bus systems, the electric propulsion system and the satellite payload. Power is stored in dual Lithium-Ion batteries and dedicated avionics regulate the main power bus of the spacecraft to provide power to all subsystems of the satellite bus and the communications payload. The satellites use a state of the art attitude determination and control system utilizing star trackers and Earth sensors for precise attitude determination and reaction wheels for accurate pointing. The satellite bus is typically equipped with a 490-Newton bipropellant apogee motor for the climb into Geostationary Orbit. In addition, the satellite uses four axial 22-Newton Thrusters and four radial 10-Newton thrusters for smaller orbit adjustments, drifting in Geostationary Orbit and attitude maneuvers. BSS-702 can also support electrical propulsion systems based on Boeing’s XIPS ion thrusters.